Project Lifesaver - Peace River K9 Search and Rescue, Inc.
Several of the PRSAR team members are certified Project Lifesaver Search Specialist and assist on searches for missing victims. In the United States we are close to 6 million persons with Dementia and 1 in 60 are effected by Autism. On top of this, the numbers are expected to double by 2020. Studies show that the longer a person with special needs wanders and is exposed to an unprotected environment the less chance that they have for survival. The first 24 hours are critical. This new program can help reduce the amount of time it takes for responders to locate and return these special needs wanderers. 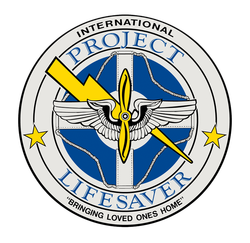 The Project Lifesaver program consists of an initial annual membership fee. These fees help pay for the cost of the transmitter and other expenses incurred by PLS. Once on the program you can expect a monthly wellness check where a trained PLS person will come to your home and check to make sure your tracking bracelet is working correctly. And if your special needs wander should leave the home, simply call 911 and a PLS search specialist team will be dispatched to recover your loved one quickly. It really is that simple. Notice to Subscribers and Caregivers- What to do If your family member goes missing? 1) DO NOT SEARCH on your own for more than 10 minutes! 2) CALL 911! You do not have to wait 24 hours to report a missing person. 3) Be SURE to advise the 911 Dispatcher that your missing person is a PLS subscriber! This will alert them that they have a tracking device on them and speed the process of recovery greatly! ​4) Make sure you have a good description of your missing loved one and a good recent picture! If you would like more information on Project Lifesaver please call your local Sheriffs office and ask for the Project Lifesaver representative to call you!